This online information portal on the African Growth and Opportunity Act (AGOA) was originally launched at the beginning of 2002, conceptualised by Eckart Naumann and Trudi Hartzenberg and implemented through the Trade Law Center (tralac). It is aimed primarily at the Sub-Saharan African trade community, communities, and business stakeholders, but also at US private and public sector stakeholders, and specifically at industry and the business community (producers as well as actual and potential exporters), journalists and the press, policy-makers, the research and academic community, and others. Ultimately, the aim is to build knowledge, capacity and transparency on all matters pertaining to US-Africa trade, and deeper bilateral engagement on investment, policy, and general cooperation. This site forms part of tralac’s (www.tralac.org) initiatives to disseminate trade law and related information to Africa and globally and is supplemented by projects that will enhance the value of this offering. This approach ensures that through the ongoing publication and analysis of AGOA-related developments, and the provision of the latest available trade data for all AGOA-beneficiary countries and the United States, the potential benefits and opportunities of AGOA are enhanced. 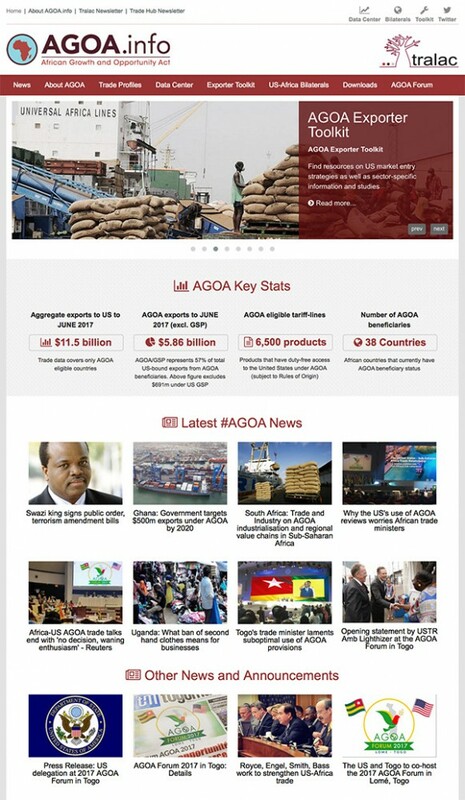 AGOA.info therefore serves as a vehicle for the efficient and effective dissemination of AGOA-related information among stakeholders in both Sub-Saharan Africa and the US. At the beginning of 2013, the original website (which has been online since 2002) was revamped and redesigned, and the content offerings further expanded, with the financial support of a grant by the USAID Southern African Trade Hub. Additional content areas were identified, including reciprocal trade and investment arrangements between the US and African countries (“US-Africa Bilaterals”), and the addition of more exporter-focused resources (“Exporter Toolkit”). The Bilaterals section houses US-Africa trade and investment related agreements and tracks developments with regard to future Free Trade Area developments. tralac is proud to partner with the USAID Trade Hubs (SA Trade Hub, EA Trade and Investment Hub, WA Trade Hub) on the provision of the “Exporter Toolkit”, a section of the site that will provide a home for a very diverse range of (exporter) toolkit related information, research, documentation and guidelines. The toolkit components on this site have been created or facilitated primarily by the USAID Trade Hubs based in Africa (Accra, Gaborone and Nairobi) and will evolve and expand further over time, both in terms of sector coverage as well as general exporter resources.